As soon as a business starts to grow, a variety of things start to require management when they just used to ‘happen’ naturally. Going from one member of staff, to ten, to a hundred and beyond, means the way you communicate with your workforce - and the way you teach them to communicate among themselves - will need to change. It won’t be the only thing that needs to change, and it may not be the most obvious one either; but the positive impact that empowering and including employees has is directly linked to a happier, more engaged, and therefore more productive workforce. It’s every bit as important as managing cashflow, and winning new business. 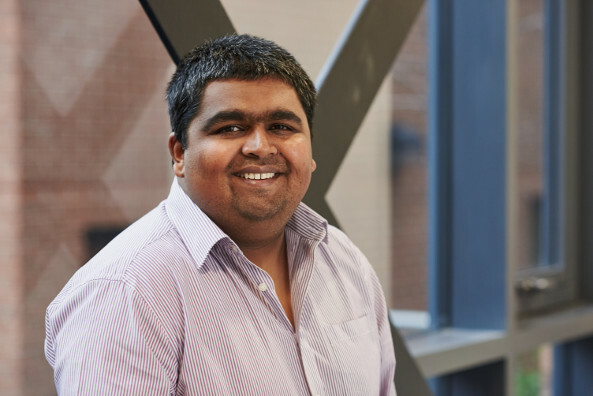 Sarat Pediredla, founder and CEO of Newcastle-headquartered hedgehog lab, has grown his business from zero staff to a current headcount of 107 in a series of offices worldwide. He explained how they harnessed the power of internal communications, and used it to their advantage. Can you tell us a little about hedgehog lab, and its growth? hedgehog lab was established in 2006, initially as a software products company. Several years later, it pivoted to become a ‘post-PC’ technology consultancy, building apps for mobile devices. Now, it also offers virtual, augmented and mixed reality capabilities through an immersive technologies division, headed by Shaun Allan. The business has grown rapidly within the past few years, with headcount rising from 46 to 98 in 2016 alone, and we now employ 107 people. It also has a strong international outlook as a means of expanding market reach, opening offices in London, Boston and India while still a relatively small enterprise. Last year, it launched two further sites in Austin and Copenhagen. How do you make sure your staff are engaged and monitor this? Transparency, directness and constructive criticism are encouraged at hedgehog lab, with staff being given an open platform through which to provide feedback to peers and senior management. We also hold informal monthly team meetings (accompanied by pizza) through which any issues of importance - positive or negative - can be discussed. Making staff feel valued is of the utmost importance to the company, which offers top-end benefits from flexible working to unlimited holidays. Significant emphasis is also placed on ensuring staff are given the equipment and training they need to do their jobs well. We reward long-term loyalty with gifts tailored to the individual. How do you manage internal communications? Both technically, and from a holistic perspective? Day-to-day communication among colleagues is largely conducted through Slack, the web-based instant messaging app. This prevents inbox build-up, facilitates seamless conversations across multiple sites and (in theory) reduces interruption. In reality, it can be distracting, but the pros outweigh the cons. We also use platforms like 7Geese and Basecamp, and produce a monthly newsletter. With a diverse team across multiple offices around the world, what are the biggest challenges and opportunities when it comes to communication and engagement? Time zones and cultural differences will always pose a challenge, but through intelligent use of technology and daily check-ins with the various teams, such issues are far from insurmountable. On the plus side, having multiple offices throughout the world encourages innovation by drawing together divergent ideas and ways of thinking. Do you think being good at these things influences growth and profitability? Undoubtedly. If you can’t communicate, you can’t accumulate! It’s incredibly important that everyone - regardless of where they are based - is on the same page, even more so now we are attracting the attention of some of the world’s top brands. We believe in doing a few things well, rather than lots of things poorly, so it’s crucial employees can work independently, safe in the knowledge their creativity is pointed in the right direction. If you’re looking for advice about managing internal communications in your business, take a look at some of the business support programmes operating across the region. Change offers opportunity – here’s how to make a commercial success of Brexit. How can R&D tax incentives help alleviate the growing pains that many business face as they look to scale-up and expand?